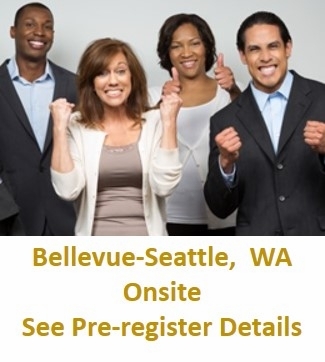 PMP(R) Certification with Exam Prep onsite live classroom training in Bellevue, WA, close to Seattle, both weekend or weekday Boot Camp classes. There's no cost to pre-register for the class until the class has a core group or individuals or small groups, then you will be ask to make your purchase before training begins. Pre-register for any of these dates now. Call or text Nereda Haque, PMP at 360-584-8614 if you have any questions or just to pre-registeremail her. SmartPath LLC is a PMI® Global Registered Education Provider* (R.E.P.) #3441. All V6 PMP classes are 100% Live and personally led by the Instructor. This class now focuses solely on the new PMP Exam which started on 3/26/18. Group Payments: If you need individual payments for your group, let us know, and we will set up a group link where each person can make their own payment. Class Times 8 AM to 6:15 PM, or as stated All current Bellevue, WA PMP Certification listed in the purchase menu are Guaranteed to Run (GTR). If you or your organization or group would like to train on any of the following dates in Bellevue, WA, please let us know. How Class Registration Works for Onsite Training: We facilitate a training based on 5 or more people or a group of people requesting the same dates. Payment can be made once an onsite class is posted in this menu. Then we Guarantee that the class will run, and place it in the menu for other people to join, just like you see the current onsite class offering. While 100% Live Online training is trending. However, we also offer weekdays training from time to time in Bellevue, WA. This PMP Certification Boot Camp class provides 35 hours for exam approval and the prep and tools you need to pass. Call Nereda Haque, PMP at 360-584-8614 if you have any questions, or if you prefer to schedule your private group over the phone. Or do try this training method: 100% Live Online using your computer. There are lots of dates offered where you can join the training. All Live Online trainees have hardcopies of the class materials mailed to them. Location: (1) 2018 156th Ave NE, Bellevue 98007 (Take 520 to 148th, to 20th to 156th NE. Parking is free at this location. Almost all of our trainees will pass the first time. Our training provides the knowledge skills, and tools that you need to pass the PMP Exam. Resitting is available even before you take your exam is free for up to 6 months, and it can be extended 2 more times over the following 6 months if you take your first exam within 30 days and you finished all quiz practice. We help you with your exam application in class. The first and second PMP Exams are not included; however, a 3rd exam may be included based on 4 compliance activities. Materials: pmWorkbook, pmWorkbook Exercise book, and Workflows. The training also includes: a free 30-day online quiz practice subscription that starts on day 3 with over 2,200 practice questions. All materials are provided in the classroom on the first day. There is nothing to do before class. You don't need any prior training in order to take this class. Audience: Project Managers, Program Managers, IT Managers or Developers, Business Managers, Business Analysts, Operation Managers, Engineers, Architects, CEOs, MBAs, Event Planners, Educators, CFOs, HR Managers, Quality and Risk Managers, Marketing & Advertising Managers - anyone who has been doing projects even if you are unaware you've been managing projects; that is leading and directing projects. You don't need a project manager or program manager title in order to claim project management experience. You need management experience across all process groups though, not in all of your projects as you may have not started or finished it, but at least in some. What are examples of projects? If you have questions, call Nereda Haque at 360-584-8614 to schedule your class if you have any questions or email her at neredahaque@smartpathllc.com. PMP Exam Application: Do you have questions about your experience? If you are already approved for the exam, then you can skip this paragraph and the next. If you're considering our training, send your resume to neredahaque@smartpathllc.com if you want further understanding about your experience qualifications for the PMP Exam. We also guide your PMP application process in class, and review it for you before you submit it to the Project Management Institute. PMP Exam Alignment: This training is aligned to the PMBOK(R) Guide (The Project Management Body of Knowledge(R)), 6th Edition for the current exam. PMP Exam Fees: The first and second PMP Exams are not included; however, a 3rd exam may be included based on compliance activities. Ask for the PMP flyer which summarizes compliance activities. Free Resitting For Current PMP Exam Trainees: Resitting is free for up to 6 months from the first day of training. Keeping up with compliance requirements can provide you 2 more resitting opportunities for the last 6 months of your exam approval. Take the exam within 15 to 30 days after training, making sure you have enough time to finish all the quiz practice (over 2,200 questions) or take the Exam within your comfort zone. We highly recommend finishing all online quiz practice before taking the exam, for best risk mitigation, along with finishing all of your prep exercises. Guarantees: Third exam guarantee (see compliance activities), free rescheduling, free resitting for up to six months, and policies. Also, if you take your first exam within 30 days and finish all PMP online quiz practice, you will also receive 2 more resitting opportunities in the last six months of your 12 months of exam approval. Free 30-day PMP Online Quiz Practice Subscription: Each trainee also receives a free 30-day PMP Online Quiz Practice Subscription starting on the 3rd day of class with over 2,200 questions. You need to confirm that you received the quiz links on day 3 of class. If you need more online quiz practice time, it starts at $39 for 15 days and up. PMP Exam costs are extra: $405 for PMI(R) Members and $555 for non-members. 2nd and third exams are $275 / $375. You will pay the Project Management Institute for your exam once you are approved. For more training details such as outline, what's in the materials, about the quizzes, Project Roadmap, very important class details, PMI requirements, etc, Click here. For class objectives, click here. 7,500 hours over 60 months with high school diploma / equivalent, plus live 35 hours of instructor led project management training. (2) Training Requirements: We provide the 35 hours of formal project management training including the prep you need to pass the exam, review of your resume. Send us your resume for review if you have doubts about your qualifications) help with your application. After the application is submitted to the project management institute, it takes 3 to 5 business days for exam approval.